Can someone explain? He didn't respond. Edited by FTR, 14 January 2019 - 11:42 PM. If you mean the illegal mod that place the red dot where arty fired, it's illegal. I meant to attach the screenshot but apparently 40kb file is "too big". Yes, a bellend introduced himself to you. There's no need to show a screen shot, you just met a bitter guy who didn't like that you killed him, so he accused you of using a cheat. Congratz! you not only killed his tank...but crushed his ego too. If you google it you will find it, basically places a red dot on the map where arty fired so you can aim and shoot without staying there looking for a tracer, it will ping the minimap and place a dot. Oh. I don't use any mods so I am not familiar with them but.. err I guess this explains everything. I think you've been hacked! Red dot means he owns a Leica camera. He did not like you using that red dot on your Scar-H and calling in a tactical nuke, so hes mad becuz bad. Just reply "get rekt" and carry on. That's why I started to read this thread, but it turned out to be most disappointing in actuality. It's 2019 and some people still think a persons sexuality is a bad thing. Personally, I think it would be quite interesting to persecute a person over the way they lace their shoes. This after all, is a personal choice and something they can quite easily change. Edited by malachi6, 15 January 2019 - 09:06 AM. There is an arty red dot/ball cheat mod that marks out where arty tracers have just fired from. I think there is also another mod that puts a visual marker on your screen for spotted tanks outside your render range, like a red line. Could be referring to either. But most of these sorts of players have no idea about cheats or how they work, they just think if someone beats them then they probably cheated. In all fairness WoT has changed a bit over the years. And tracers are one of those things that changed. Used to be easier to counter arty with thicker tracers who were a bit more visible for a bit longer too. Now is far more likely that someone who counters all the time with higher success rate is using this mod. I used to counter every match, now i lose tracer starting location even if i'm looking at that area so i rarely counter anymore. Specially that arty damage is lower and is highly probable that you will not one shot kill the enemy arty with a splash, you need a direct hit. So getting countered after my first shot will most likely make me believe that the enemy is cheating, specially if i play my french arty autoloader and will not move after one shell and its tracer is way smaller than the bigger caliber arties out there. It's the message you get from arty players that instantly go to the same spot 90% of the SPG's on that map always do. And that don't know they have a massive tracer when firing and don't relocate at all when hit. Edited by Balc0ra, 15 January 2019 - 11:44 AM. When you move from the initial position, there are no friendly tanks nearby and you get hit just after you fire, then its someone using a cheat for sure. The most obvious guess would be that he's calling you a cheater. As the others say, it's probably a reference to a mod. I looked it up now due to not having heard of it before. It seems to be a mod that places a red dot or square on the map where the enemy shot from, and this indicator is visible while you're in overview. It basically tells you where to shoot. It's an illegal mod and using it could get you permanently banned as per the game rules. 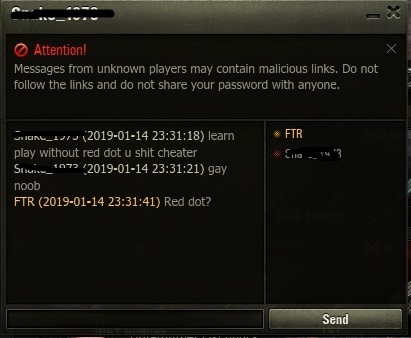 Personally I've never been called a cheater for hitting enemy artillery and I tend to hit them a lot. At least not that I can remember. It may have happened when allies and enemies could communicate with one and other. It's likely since the game was a lot more toxic back then. I guess I'm one of those who are good at countering then. I see that as my prime objective on most maps. On some maps it's very easy to counter because artillery positions are very obvious. Occasionally I blind-shot if no other viable enemy has been spotted yet, such as heavies or slow mediums. On the wrong map from the enemy's perspective, I may counter your arty in the first shot and even if you haven't taken a shot yet, just to ramp up my potential DPM and lessen the enemy's. Sometimes I will land a direct shot. I frequently take out two out of three artillery on maps like Lakeville and Mines. On Lakeville, most artillery will position themselves to support the valley. On mines, they rarely move from spawn. There's usually only a few spots people stand at all on most maps without getting spotted by flanking lights. Open maps with a lot of trees like Malinovka is harder to counter at because arty may stand in any number of places along the red border. This is where teamwork can change the battle real quick, such as giving your allied artillery the direction of enemy artillery. This rarely happens though and it's unfortunate because it usually means another loss in an otherwise productive match. To avoid getting countered myself at certain maps since I'm an obvious target, I place myself in odd positions and try to take out enemy arty first. Even if I don't land a direct hit, they'll have to move and that usually gives me a free shot without having to worry about enemy artillery immediately shooting back. Then I may move and the enemy arty may wait for me to shoot again from my previous position, meaning they waste time and therefor DPM, or maybe even wastes a shell trying to hit me where I'm not. Countering smaller artillery is a challenge but not because of the arc, but because they tend to move after each shot and they do so quickly. If your shell time is longer than five second to where they are, it's usually not worth trying to hit them. If you know where to look, you'll spot any arc regardless of tank. but the red dots are so much fun! It could also mean that you need to turn on the color blind mode if you can't separate green allies from red enemies.